LUHANSK, July 28./ITAR-TASS/. Five civilians were killed and 15 were wounded in Luhansk over the past 24 hours in continuing shelling of the city, the press service of the city council said on Monday. A driver was killed and two passengers were wounded when their minibus came under fire. Artillery shells destroyed many houses and caused fires. Roofs and windows were left broken in many buildings. Electricity was cut off to more than 30,000 people all over Luhansk. More than 8,000 were left without water, and more than 4,000 without gas. Repair work was seriously complicated by continuing shelling. Meanwhile, sources of the Luhansk People's Republic reported the offensive of Ukrainian troops was stopped north of Luhansk. The Ukrainian forces' attempts to break through to the airport across Alexandrovka failed. 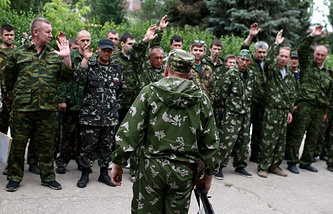 The enemy was regrouping in the area, the local Novorossia news agency cited militia as saying. Only regular artillery shelling and operations of separate groups were reported in Luhansk. Air strikes against Luhansk were also less intensive. On the whole over the month of the offensive operation in the self-proclaimed Luhansk People's Republic, Ukrainian troops only cut off the Lisichansk area (the west of the Lugansk region), militia sources said. In the Donetsk region, the remaining Ukrainian forces were blocked in a southern area. They took heavy losses from militia gunfire. The last corridor near the checkpoint of Marinovka was closed on Sunday, July 27. Access is possible only by air, but with great risk for aircraft that drop supplies with parachutes. "The situation of the surrounded troops continues worsening. Some soldiers run out to Russia," militia said. 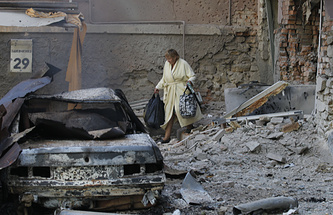 In the city of Donetsk, the Ukrainian government forces' offensive was stopped on the outskirts. Fierce fighting near the village of Peski stopped the troops, but intensive artillery shelling of residential districts in the city was continuing. Heavy fighting with losses on both sides continued on Monday in Debaltsevo, which was seized by Ukrainian forces on Sunday under cover of massive artillery shelling. Roads to Gorlovka were blocked by Ukrainian troops. Militia were forced back into the city. The section between Gorlovka and Alchevsk is the only one firmly held by Ukrainian troops. On most of the rest frontline sections, the offensive launched on July 1 has been stopped, militia sources said.